Rims - tires front: 7" - 7.5" x 15", rear: 10" - 11" x 15" front: 205/55 x 15", rear 265/45 x 15"
That anti-lag pre-turbo butterfly in the picture above is called DPV (Dispositif Pre­rotation Variable - Variable Pre-rotation Device) and was devised and used first by the French guy Jean-Pierre Boudy in the early 80-ies. The real throttle bodies are after the turbo. 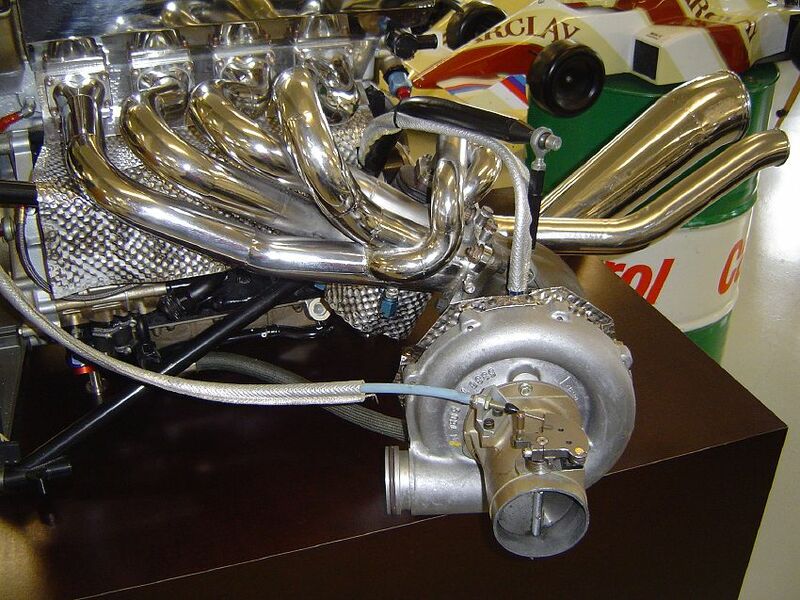 This was first used at the Monaco GP in 1982, and developments of the same system are still used in Formula One. But because Boudy defected to Peugeot with his ideas, the 205T16 was the first turbocharged rally car to use his system (The T16 being out before the final evolution R5 Turbo – The Maxi 5 Turbo). Which Renault calls DPV, or Dispositif Pre­rotation Variable (Variable Pre-rotation Device). "At the very beginning we had made the decision to use it on the Group B R5 Turbo. It's not really necessary for road cars and a little expensive for them, but it's not so complicated". It may not be "so complicated" but the DPV system is an 'extremely effective way of ensuring near-instantaneous throttle response from a competition turbocharged engine’. The system provides for variable air areas and direction angles at the intake to the compressor wheel in advance of the rotation period during which the compressor turbine will require those conditions. It's not a by-pass system, it's essentially a multi-variable nozzle arrangement which is mechanically linked to the throttle and which changes the direction and area of air which hits the compressor wheel according to throttle position. The rate of change of air flow area and direction is not exactly linear, but it's progressive and always increasing toward full flow at maximum compressor wheel speed. This irregular mid-compressor-speed flow, which constantly changes the way the air hits the compressor vanes in the mid-range, improves the compressor's efficiency under part-load, because it is arranged so that the turbine will idle at a higher speed than it would given a fixed intake air direction and area. And of course, the higher the compressor idle speed, the shorter the time it will take to reach its important operating RPM. Result: less lag. The DPV is inoperative at each end of the turbine's speed range. Under pedal-to-the metal full boost conditions it has no effect because there's regular full flow to the compressor, and with the throttle closed the DPV is shut down as well. But it is not just retained inertia and completely eradicated turbocharger lag which form the real benefit of the DPV system, because there's another major advantage in that as a result of there being no by-pass or blow-off to atmosphere, and because it's an internal function to the turbocharging system, there is no pressure wastage in the all­important part-load condition (ie. The blades don't stall during gear changes, or on/off throttle movements).